My Lawn-Boy 10683 Insight Series lawn mower has to be one of the best lawn mowers I have ever purchased. Prior to this lawn mower I had a craftsman lawn mower. I usually prefer craftsman to brands that I am not familiar with; however, I decided to give the Lawn-Boy lawn mower a shot. I am glad I did because it is a lawn mower that is just as good as a craftsman lawn mower. My mower cost me a little over four hundred dollars including taxes. This mower definitely had its nice share of features and it was the features that influenced my purchase of this lawn mower. The Lawn-Boy lawn mower has a 6.5 hp easy start engine. It has plenty of power and I don’t have to worry about it not being able to finish the yard due to the lack of power. The easy start of the Lawn-Boy lawn mower is also great because in most mowers the start up is the hardest. The start up is especially hard for people who don’t have lots of force like me. One big feature of the Lawn-Boy 10683 lawn mower is the fact that it is lightweight and I can steer it easily. Like I stated before I don’t have as much force as men, and it is very hard to operate lawn mowers that are heavy and hard to steer. The Lawn-Boy mower also has ergonomic features that are great for people who need them. 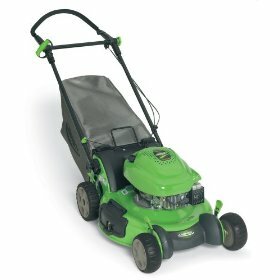 Some of the ergonomic features that this lawn mower includes are an adjustable handle and a soft comfortable grip. What I really love about this lawn mower is that I can also use this lawn mower as a mulching mower. I use this lawn mower to mulch my lawn in order to keep it beautiful and healthy. Overall, I love my Lawn-Boy 10683 Insight Series lawn mower. It’s a great mower to have and it basically functions on its own. All you need to do is push it a little and the rest of the work is done by the mower. I give this lawn mower a rating of 10 out of 10 stars.